Freshwater fishing is unique as there is an extremely wide range of baits available to the anglers. Examples of the wide selection are flies, corn, lures and many more. Below I will discuss the various types of bait. Frogs are a useful bait and they can be used dead or alive to target a number of species such as catfish namely sharptooth catfish. To ensure a solidly hooked frog, make sure you wipe off the slime on the frogs body before hooking them. Frogs can be caught with a fine mesh. Crickets can be used to target species such as Yellowfish, catfish and any other hungry and scavenging fish that might swim by. Common crickets can be found in gardens under rocks or bricks. A tip when hunting for them is to use a torch during the night. Certain species such as carp and catfish love snails. The common method of using them will be crushing them and then hooking the snail/slug onto the hook. Prime time to collect snails and slugs will be after heavy rains or before a storm. Maggots are a classic bait and nowadays they can be purchased from most fishing shops. Dead maggots will be eaten by most fish, but one cannot get anything better than a live maggot. Many anglers are able to grow their own maggots by leaving a piece of meat out for flies to land on. Maggots can be kept in the fridge. Worms are the freshwater anglers all time favourite and there is a reason for this. The more active the worm, the more attention it will attract. 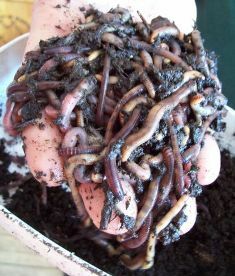 Worms can be found under objects and in moist soil. Keeping them is easily done in a sealed plastic bag or container with damp soil or newspaper. The picture on the left is a handful of earthworms which are the most common type of worm used for freshwater fishing bait. As with saltwater fishing and all other types of fishing, a small fish will catch a big fish. In the case of freshwater fishing it is exactly the same principle. Small fish that are caught and used as live bait are excellent and the results from that can be highly rewarding. Dead fish can also be used, but in the case of predators such as Tigerfish, live bait will attract their attention and the Tigerfish will hunt the crippled bait. Squid is a strong, leather like bait that is suitable for a number of species. The fresher the squid, the better it will perform. A disadvantage of squid is that it is expensive.